I. Listen to the sound / θ / on its own. Look at the mouth diagram to see how to make this consonant sound. To make the target sound, put your tongue between your teeth. Blow out air between your tongue and your top teeth. Do not use your voice. III. 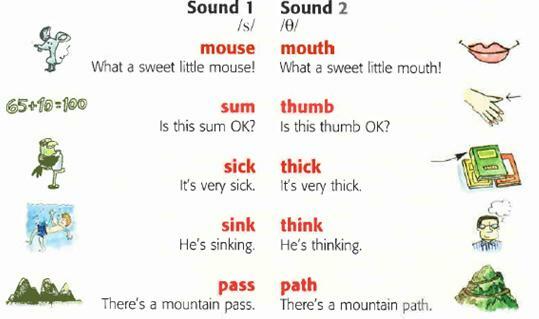 Read these examples of the sound / θ /. IV. Read the sound / θ / in the words below and compare it with the words on each side. Three thirsty authors, Catherine and Samantha, a thousand and nothing, moths or something, it’s a worthy month, thank you Ruth, I thought she was thirty three, last month on Thursday, a thin mathematician, nothing like youth. VI. Read the following sentences. Mind the right articulation of the sound / θ /. 1. Thursday of this month is the 16th. 2. I don’t think they’ll be very thick. 3. I’ll thank the others when I come on Thursday. 4. Arthur thinks of nothing but theatre. 5. Thelma sings the same song. 6. Theo’s throat throbs and thumps. 7. Ted threw thirty-three free throws. 8. A thousand thanks to you both. 9. Timothy likes to be in the thick of things. 10. I have a thousand and one things to ask you about. 11. Speak the truth and nothing but the truth. I. Listen to the sound /ð/. Look at the mouth diagram to see how to make this consonant sound. To make the target sound, put your tongue between your teeth. Blow out air between your tongue and your top teeth. Use your voice. III. 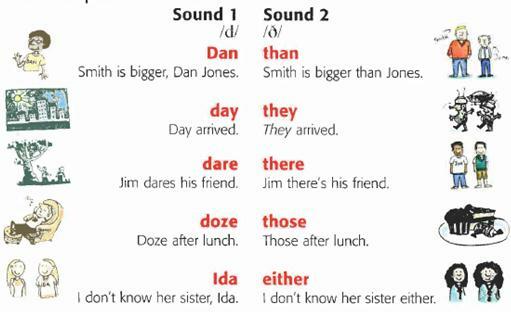 Read these examples of the sound / ð /. IV. Read the sound / ð / in the words below and compare it with the words on each side. Another brother, rather smoother clothes, neither this nor that, either here or there, other feathers, than the others, together with them, breathe in and breathe out. VI. Read the following sentences. Mind the right articulation of the sound / ð /. 2. I would rather have these. 3. Mother is bathing the baby. 4. Three things on this side and three things on that side. 5. Haven’t they seen the others yet? 6. They can’t go there dressed like that. 7. They’ll take the others when they go there. 8. The less men think the more they talk. 9. These are three brothers, these are their father and mother, and this is their other brother. 10. Birds of feather flock together. What’s this? – This is the zoo. What are those? – Those are zebras. What’s that? – That’s a zebu. What’s this? – This is Z.
What’s that? – That’s zero. What are these? – These are zips. Who’s that? – That’s Zack. The Throng of Thermometers from The Thuringian Thermometer Folks arrived on Thursday. There were a Thousand Thirty-Three Thick Thermometers, Though, instead of a Thousand Thirty-six Thin Thermometers, which was Three Thermometers fewer Than The Thousand Thirty-six we were expecting, not to mention That They were Thick ones raTher Than Thin ones. We Thoroughly Thought That we had ordered a Thousand Thirty-six, not a Thousand Thirty-Three Thermometers, and asked The Thuringian Thermometer Folk to reship The Thermometers; Thin, not Thick. They apologized for sending only a Thousand Thirty-Three Thermometers raTher Than a Thousand Thirty-six and promised to replace The Thick Thermometers wiTh Thin Thermometers. We’ll weather the weather whatever the weather whether we like it or not. - Arthur and Martha are such enthusiasts! They’re so enthusiastic! - What are they so enthusiastic about? - Oh, about everything! Among other things, they’re both very enthusiastic about the theatre. - I loathe the theatre. And I loathe enthusiasts. - I loathe Arthur and Martha.